It was my first full day in Chengdu. This is the largest city in Sichuan, a city of over 10 million people. Yet, it does not feel that big. Things have an orderly feel. The city is laid out like a bicycle wheel, a plan which no doubt originated more than a century ago. Main roads radiate out from the center, which are connected by major concentric circle arteries. High rise condo complexes are limited to about sixteen stories and while there are a good many of these, the majority of the city is about seven stories high. 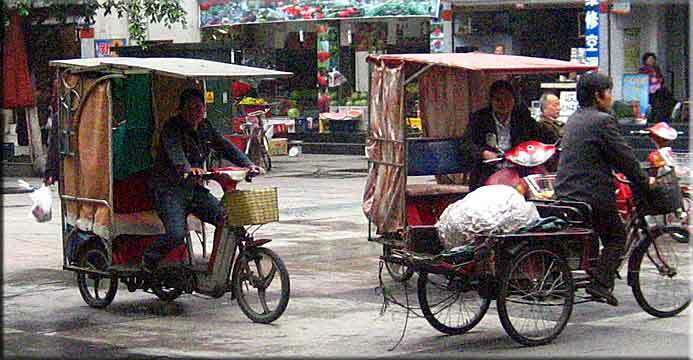 All big Asian cities are noisy, but this one less so. As we started our morning walk, I realized why. Almost all the scooters and pedicabs are electric. They move in absolute silence, usually at about 15 miles per hour. The most popular designs look like a mountain bicycle, with a battery pack that looks like a long cinder-block, and an electric motor mounted in the rear hub. The battery pack has a handle and can be carried into the apartment for charging. Useful charging stations appear around the city and seem to be free. On the other hand, the smog is probably the worst I have ever seen. At noon there are no shadows at all. It is only slightly brighter than a gloomy day in the Pacific Northwest. I imagine that most of the smog is from coal rather than from vehicles, as the relatively low traffic density and the high ratio of electric vehicles cannot account for the bad air. You will see little blue sky in the pictures to follow. Jim Burkett lives on the top floor of a sixteen story condo. This includes a portion of the roof, which Jim has decorated with small trees, plants and some bright red roses. He has comfortable chairs under an awning, and it is a very pleasant place to sit and enjoy the cool of the evening. Right now, in mid-April, the evenings are indeed cool, perhaps 60 degrees, and the day time temperature stays below 80. I am told that it will not be long before the summer becomes extremely hot and muggy. Jim has lived here for a year, and as we walk along, he pauses to say hi to the fruit vendor, and other various shop owners with whom Jim frequently does business. We stopped at a hole in the wall dumpling shop and each picked up four shau lung bao (small steamed dumplings) to nibble on as we walked. I got two chicken and two vegetarian, which, I must admit, I managed to ingest rather quickly. We stopped at a non-descript ATM next to the police station, which happily recognized my Mastercard and coughed out 2,000 Renmenbi without complaining ($300). Police are visible everywhere, many on their electric bicycles with the blue flasher mounted on a pole. Yet, they don't feel intrusive. Were I to stay here more than four days, I would be required to go to the police station and register my location. In a hotel the registration occurs automatically. 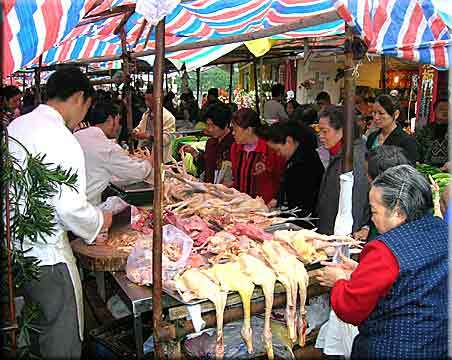 Our walk took us to the morning market, which was colorful, social and fun as markets tend to be all over the world. A half dozen ladies admired a duck and passed it around examining its quality, while the other ducks lay ignored, their slit necks hanging over the end of the table. 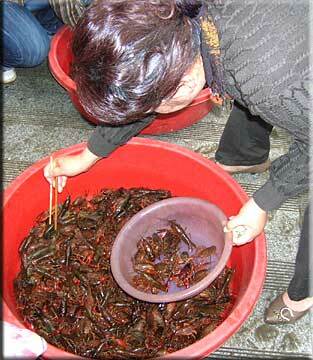 A lady merchant used chopsticks to lift live crawfish out of a pan into a plastic bag for her client. The spice table was all color and fragrance. 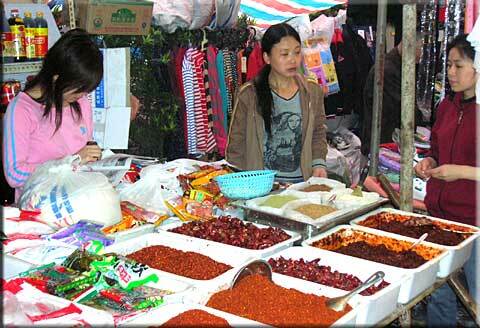 The main feature were the red chilies, the staple in Sichuan cooking. These very hot peppers were whole, ground, pasted, liquid, and fermented, and surrounded with a whole array of other spices that are essential to this cuisine. The key dish is the hot-pot, an oily broth awash in red pepper, but also heavily spiced with other accompaniments. In this broth, almost anything can be cooked; meat and seafood of every description, often as a skewer which is placed into the pot. If tacos are Mexican, then hot pot is Sichuan. I love spice, and as I admired this table in the maket, I knew I would try the spicey hua guoa (hot pot), I just didn't know when. We continued on to a huge, two story supermarket, one of several chains found in China. 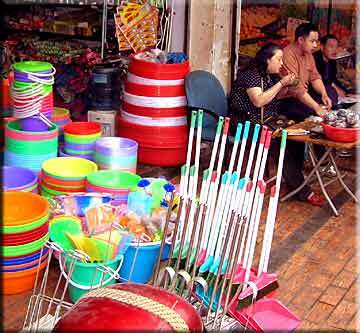 I was astonished at the variety of foods, cosmetics, and appliances available. Soaps featured Dove, Safeguard, and perhaps a half dozen other names that are familiar. Shampoos, sodas, and packaged foods included many of the names we know, as well as many Taiwanese brands. I was told that this chain is owned by a Taiwanese company. The local foods were especially interesting. There were jars of pickled vegetables of every description, including various pow tsais, kimchis, and many others I did not recognize. 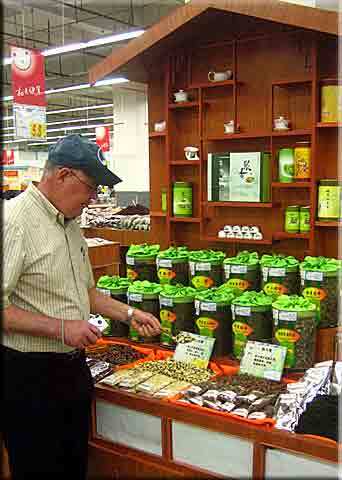 Tables featured large glass jars of bulk teas, each carefully labeled, with the type of tea and its region. Rice was tightly vacuum packed in plastic wrap, and prices ranged from precious to cheap. Bins spilled over with cheap rice, which customers ladled into plastic bags. 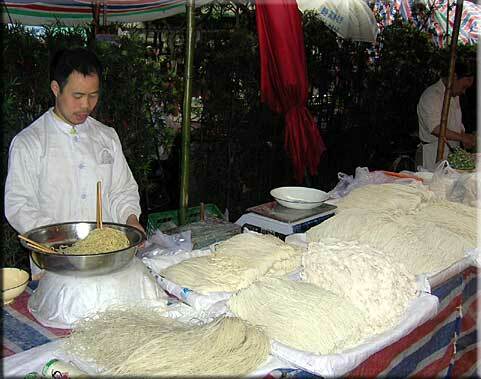 China has acknowledged a world-wide rice shortage, but it has vowed that its people will always have rice. Welcome sign to Jinli Street. 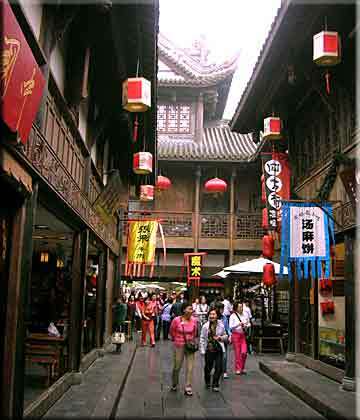 We went next to Jinli Street, one of the ancient streets of Chengdu which has been restored to its old appearance. 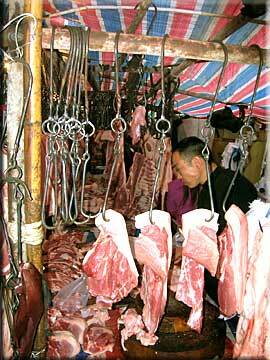 It is a Chinese "Williamsburg," with merchants dressed in traditional costumes and often sporting proper beards. It was very well done and proved to be a step back into time. 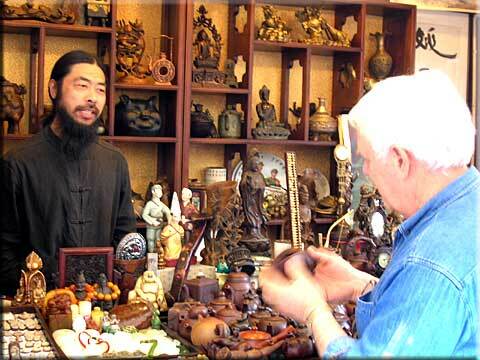 We saw traditional artwork, teapots, toys and all manner of things. Open restaurants appeared so authentic, one expected to see a martial arts fight break out with triads floating across the room. Snack food was everywhere. I had a beef rib which was well smoked; it would give Memphis dry-rub a real contest. I also had a skewer of scalloped potatoes which I lifted out of a hot-pot and left my mouth tingling for twenty minutes. We stepped through some Chinese doors into, amazingly, a Starbucks, then sat and had coffee in their old China courtyard, under a tingtze (gazebo), admiring the gentle sweep of bamboo which lined the courtyard wall. This purveyor of old pottery loved his job. Jim Burkett examining a teapot. Map of Yangtze River, Chongqing to Wuhan: http://encarta.msn.com/map_701517763/Yangtze.html best if you zoom in a bit.